I count myself very lucky in that I have normal skin or skin that really looks good for my age. Why is that you may ask? Because I take care of my skin with products that work, that have the best ingredients in them and that actually do what they are supposed to do. One of these lines is Jan Marini Skin Research. Compiling her products into the perfect Jan Marini Skin Management System, Jan Marini, who is and has been a pioneer in the field of skincare (she was around to help spread the news of the alpha hydroxy acid and how good it was for your skin). She also uses Vitamin C, anti-oxidants, AHAs, BHAs and sunscreens to help keep skin looking its best. The first product in the set is the Bioglycolic Face Cleanser (8 fl.oz./237ml). This creamy cleanser contains glycolic acid to help lift away dead skin cells and thus get rid of them. It exfoliates dead skin and lets brighter, lighter skin show through. Do not let get into eyes. the second product in the series is the C-Esta Face Serum (1.fl.oz./30mL), which is a wonderful product that lifts, firms and tightens the appearance of facial contours with this exceptional, antioxidant cocktail featuring Vitamin C and DMAE for powerful free-radical protection. Skin looks brighter and has less hyperpigmentation. Both of these products are to be used day and night. The third step in the system is the Bioclear Face Lotion (1 fl.oz./30mL). All's clear with Bioclear! A powerful combination of glycolic, salicylic and azelaic acid provide a broad-range of benefits for dramatically smoother, clearer, more luminous looking skin. Less hyperpigmentation, more of a smoother, more even tone. Less redness and more soothing ingredients for a more radiant complexion. All of these ingredients will show off a more beautiful, radiant complexion that is yours! Use day and night. The final product is Transformation Face Cream Step 4 (1 0z./28g), which goes way beyond simple hydration with this luxurious, patented growth factor, peptide and antioxidant solution! The ultimate in advanced hydrators to reduce the appearance of aging and damaged skin. Use as the last step at night. Finally, for day time, Use the Antioxidant Daily Face Protectant SPF 33 (2 oz./57 g). The ultimate in wearability! This anti-oxidant face protection has the best that money can buy when it comes to gorgeous skin, that is protected from the sun's UVA/UVB rays. It has Avobenzone 1%, Octinoxate 7.5%, Octisalate 5% and Oxybenzone 6%. These are all physical sunscreens, not mineral, so please, if you are allergic to these do not use this product. This fan favorite combines water-resistant, broad-spectrum UVA and UVB protection with oil control and advanced hydration for the skin. So, after using all of this how did my skin look? I want to show you before and after photos. As you can see the skincare routine has evened out my skin tone a little bit more and it has helped out any hyperpigmentation that was there. It also got rid of any redness that may has been developing and redness from acne scars. I LOVE this set. It is expensive but worth every penny. Jan Marini has some of the best skincare on the market. She always has and always will be at the forefront of skincare. Her work and research surpass all others. Overall in the last three weeks my skin has never looked better. 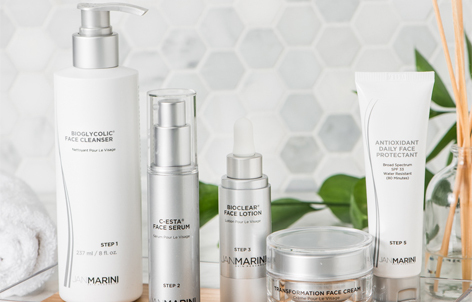 The Jan Marini Skin Care System is available through http://www.janmarini.com/skin-care-management-system/; Like JMSR on Facebook: https://www.facebook.com/JanMariniSkinResearch;Follow Jan Marini on Twitter:@JanMarini; Follow Jan Marini on Google+: https://plus.google.com/+janmarini/posts; Follow Jan Marini on Pinterest:https://www.pinterest.com/myjanmarini/ and Follow Jan Marini on Instagram:https://instagram.com/janmariniskinresearch.